Editor's Note: As they head into seventeen years of existence, we thought our readers might enjoy learning a little more about this classic motorcycle club. Special thanks to Walt Greenwood for providing the gist of this text. Elizabeth Zevely was a docent at the Museum of Northwest Art in LaConner in the spring of 2002 and she got to talking with co-docent Sherry Barber about motorcycles. 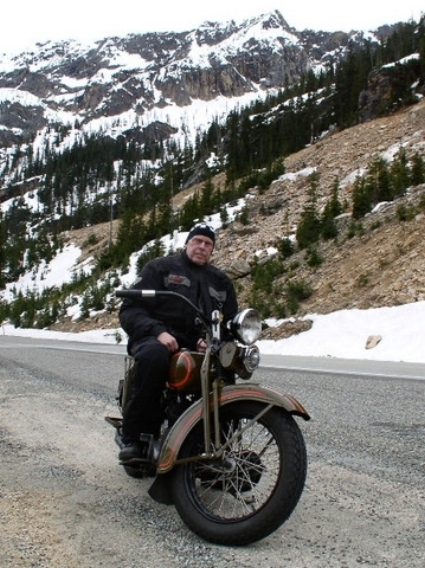 Elizabeth’s deceased husband had been the personal physician of famous British Columbia motorcycle dealer Trev Dealey years ago, so she was familiar with motorbikes. Upon learning that Sherry’s husband, Terry, had a collection of vintage motorcycles, Elizabeth came up with an idea to have a vintage motorcycle show concurrent with the annual Oyster Run in Anacortes to “show the ‘Oysterers’ what real motorcycles looked like. Soliciting help from Terry, a plan was hatched to have a show in September of 2002. Terry approached friend and local BSA Gold Star owner Jack Richardson to join the planning group. With Elizabeth’s connections, the local Arts Depot Train Station was secured for the venue, the local Kiwanis Nooners donated $500 toward expenses and Elizabeth secured the use of a local painting of a classic Harley which was used as the artwork on the first show poster. Jack and Terry distributed flyers to the local motorcycle dealers and clubs, also securing the support of the Seattle based Vintage Motorcycle Enthusiasts club (VME) of which they were both members. On the day of the show more than 40 antique and classic motorcycles showed up and the event was an overwhelming success enjoyed by hundreds of spectators. Several of the local participants asked about having a regional club to continue the camaraderie and sharing of interest in vintage motorcycles. A lunch meeting was scheduled for the following month (October 26, 2002) at the Royal Fork Restaurant in Mt Vernon, WA. The Royal Fork was chosen because it was a buffet and had private meeting rooms for groups. 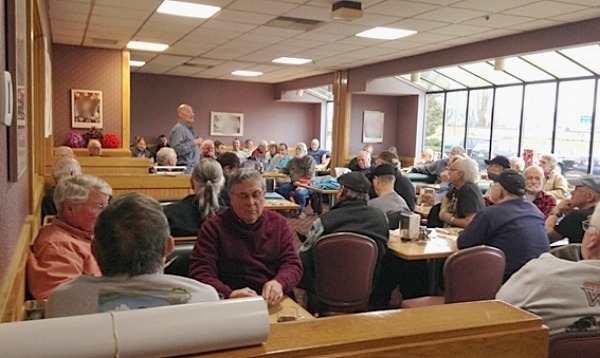 Approximately 25 people attended the inaugural meeting and a petition was signed by ten people to become a North Sound chapter of a Seattle-based vintage motorcycle club. The inaugural signers were Frank Durksen, Terry Barber, Terry Kellogg, Guy Fealey, Mel Watson (deceased), Jack Richardson, Ron Titensor, Eric Anton, Elizabeth Zevely, and Rick Fisher. Provide a format to periodically get out and ride old motor bikes. 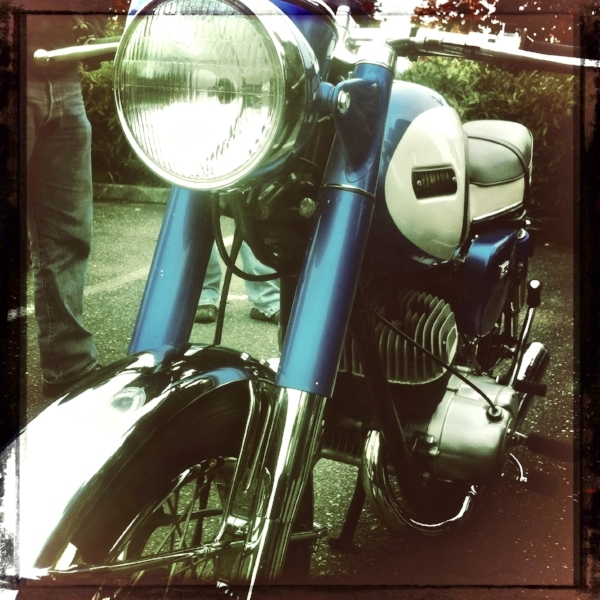 Have a regular venue to meet and network with other like-minded people interested in old motor bikes. To have a program that provides value and interest to the membership to maintain his/her regular participation and enthusiasm. Membership started to grow as word got out and local events were organized including rides, shows, a swap meet and participation as a group in regional car and motorcycle shows, etc. Monthly lunch meetings included guest speakers and opportunities for members to share their interest in vintage motorcycles with like-minded people. It also became an eagerly-awaited social event for many of the members. As the size of the local chapter grew, the members and organizers felt that they wanted more self-determination that could only be achieved by becoming independent. At a spirited meeting in December 2006, the members unanimously decided to become an independent non-profit corporation. By unanimous vote, the decision was made to become a free-standing club and the name of Washington Vintage Motorcyclists (WVM) was chosen and approved by the membership. The club was incorporated on December 27, 2006, as a not-for-profit corporation in the State of Washington. At the organizational meeting of the Board on January 13, 2007, the organizers appointed the positions of President Terry Barber, Vice President Bill Stevens, Treasurer Mary Bliss, Secretary Sam Ingraffia, and Director Gary Vallquist. A budget and bylaws were adopted, and the club was up and running. In 2007 one of the members, Frank Durksen, purchased a 10 acre low-bank waterfront lot on the Methow River in Twisp, Washington. After a discussion with Stevens and Barber, Durksen offered the property to the club for the location of a summer rally/camp out. Stevens suggested that an Over-The-Pass ride would be in order and thus was born what has become an annual rally event in eastern Washington. The first year (2007) had attendance of 27 members in tents, RVs, and motels. In 2010, Durksen sold the property and the venue moved to the Big Twin Lakes RV & Campground in Winthrop where it now averages 90+ participants. By the end of 2016, the club has grown to 140 members, some of whom are in eastern Washington, Oregon, and British Columbia. The annual April swap meet has become a premiere event for Northwesterners who have an interest in vintage motorcycles, and the annual summer rally has become a signature event. Other premiere events include an annual Mt. Baker Run and BBQ, along with local rides. The club still puts on a vintage motorcycle show in Anacortes concurrent with the Oyster Run.